I’m normally not a believer in reverting back to an all-natural approach to health or being concerned with this-and-that being a “toxin”. Our ancestors practiced the ultimate in the all-natural approach because they had nothing but herbs, leeches, and old-wives’ tales and were lucky to live to the age of 50 (and they also used asbestos pot holders and Coca Cola had real cocaine in it) but I experienced my own epiphany with silver fillings. I know for a fact that there’s an auto-immune party going on in my bloodstream and it always has gone on- if I were a betting woman I’d say it’s due to a genetic defect of some sort because my problems started long before I had my first silver filling in my mouth, but for a period of time I was suffering with severe digestive system problems. Other than being diagnosed with small bowel bacterial overgrowth syndrome I have never been able to find out the exact cause of those issues- they mirrored inflammatory bowel disease (bacterial overgrowth wasn’t enough to explain all of the symptoms) but my mother had run into an article about mercury in fillings possibly being the cause of a myriad of problems. I know for a fact that I’m literally allergic to everything on the environmental allergy testing panel and I probably have more auto-immune antibodies than the ANA, DNA, and Thyroid ones that have been scientifically confirmed, so I decided to have all of my silver fillings removed. I had them in every single molar except one. I took every Friday off from work one summer and went to the dentist every week. By the time we were halfway through the process my digestive symptoms had significantly improved and I no longer needed the medications I had previously taken for colitis. It wasn’t a miracle cure for the rest of my strange ills, but hey- it’s one less thing. I figured, why give my body another thing to react against if I don’t have to? Where did you go to have the mercury removed? How much did it cost? Amalgums, metal silver on teeth looks ugly and disgusting. Silver mercury teeth are ugly. Teeth without metal mixed in with the bones looks more comely, definition more beautiful then does a tooth with something that sould not be mixed in with it, on top of it. I have one that looks particularly hideous in the back of my mouth on the left side of my jaw. 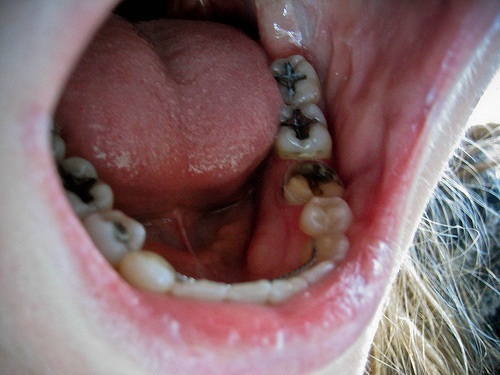 Teeth without mercury are lovely, because they look more natural. Teeth with metal are unnatural. Why would our government want metal in my mouth for and everyone else’s for anyway?